Hybrid lenses are a cross between hard and soft contact lenses. Hard lenses (Rigid Gas Permeable lenses, or RGP) offer certain advantages that soft lenses can’t. Hard lenses are made of sturdier plastic and therefore last longer, they are less likely to become contaminated with bacteria or other deposits because they don’t contain water, and they generally offer clearer, crisper vision than soft contact lenses can. However, soft lenses have one major attraction: most people find them more comfortable to wear. Hybrid lenses give you the best of both worlds. These lenses combine the comfort of a soft lens with the clarity of a vision of a hard center. The result is a comfortable, easy-to-wear lens that also offers the benefits of RGP lenses. At Weston Contact Lens Institute, we recommend UltraHealth Hybrid Lenses from SynergEyes. These lenses promote good tear exchange and increase oxygen delivery to the eye, making them a good choice for people with unusual conditions of the cornea. 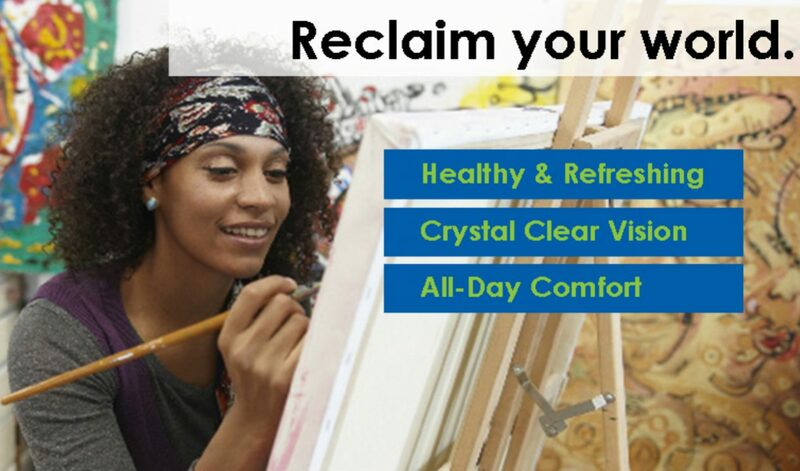 UltraHealth lenses provide superior comfort and crystal-clear vision for extended periods. Thanks to the combination of the soft outer lens with an RGP center, UltraHealth lenses encourage optimal tear and oxygen flow. These lenses stay naturally hydrated as fresh tears circulate each time you blink. This action helps keep your eyes from becoming dry and keeps your lenses clearer for longer. The soft outer edge gives them a familiar feel for soft lens wearers; most people who try them express surprise at how comfortable they are. In fact, they fit and feel almost exactly like soft lenses, making them perfect for all-day wear. They also provide built-in UV protection to keep your eyes safe from the sun’s damaging rays. When you visit Weston Contact Lens Institute in South Florida, we will provide a thorough examination and determine whether any cornea irregularities are present. UltraHealth lenses come in two different designs, and we’ll help you determine which one works best for you. Some patients respond better to the standard UltraHealth lens while others find that the UltraHealth FC is a better fit for them. If you have had trouble finding the right contact lens because of irregularities in your cornea, UltraHealth lenses from SynergEyes may be the perfect solution. Contact Weston Contact Lens Institute in Weston, FL today to schedule a consultation.